This was a long weekend here in Canada. Here in BC it was BC Day today. 2008 marks 150 years since the founding of the Crown Colony of British Columbia in 1858. I had Friday off from work so for me it was a very long weekend–4 days total. This weekend was very productive quilt wise. This first quilt is the Warm Wishes quilt I have previously shown. Here it is at the completed flimsy stage. I am back to using my garage door design wall system. I forgot to measure this quilt before folding it and adding it to the “to be quilted” pile, but as you can see, it fills the garage door opening. Anyone need a quilt to fit a garage door? 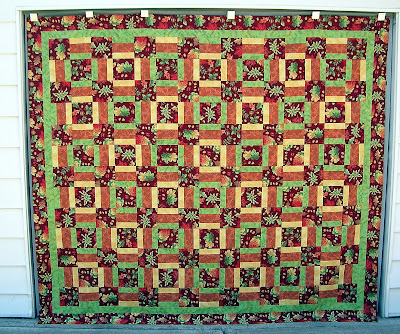 This is my Poppy 4 Patch Stacked Posies quilt finished to the flimsy stage. As I said in a previous post, the fabric left from making the blocks was way too busy for me to use as a border so I went with my favorite neutral; green. The width of the outer border is cut 6″–the width of my long ruler. Using the 6″ measurement makes for easy cutting of the border pieces. 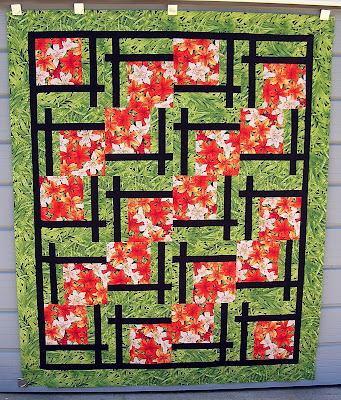 This quilt top measures 57 1/2″ x 66 1/2″. And the third quilt that was finished to the flimsy stage this weekend is my Tiger Lily BQ2. As I stated before, I just couldn’t leave this one without borders. I had to piece the outer border in several places and I have just one tiny strip left. The border pieces were cut 4 1/4 inches wide–to maximize the use of what fabric I had left. My mother will be pleased to hear that I have a small piece of the lily fabric left. Although my mother does not quilt, she has her eye on that fabric! 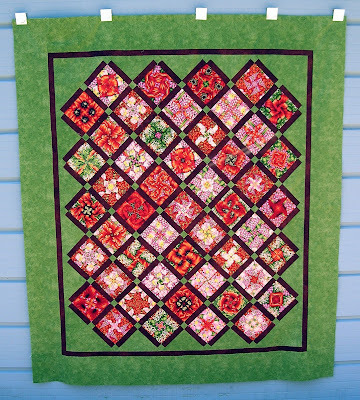 LOL This quilt top measures 65″ x 78 1/2″. The wind was blowing a bit when I was trying to take a picture of this last quilt. Note the magnet in the lower left corner of the quilt holding the quilt from moving in the breeze. I love this “design wall”.